I’m away in the Lake District next week, so I will be unconnected to computers and this weblog. This entry was posted in Imported on May 28, 2004 by lance. has become a voluminous weblogger and a must read for those interested in geopolitical instability. “Good tidbit from my old Pentagon boss Art Cebrowski: he says he was invited recently to brief Bill Gates and a host of his business friends from around the world. He gives them the Core-Gap thesis and describes the military-market nexus (the Decalogue). The response? As always, the business world gets that stuff intuitively. That’s why I say this new vision I push is not mine but the worlds: its a reality I capture, not a dream I concoct. Its happening and will happen within the Defense Department not because people like myself advocate it, but because the environment simply demands it from us. I’ve changed the host of Davos Newbies, and there are a few problems as the change propagates through the Domain Name Server system. I hope normal service will be resumed tomorrow. This entry was posted in Imported on May 27, 2004 by lance. I could spend days staring at the extraordinary photos coming from the Mars Express. 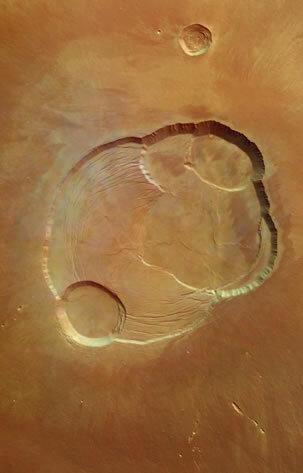 Olympus Mons is three times the height of Mt Everest and at its summit the caldera (above) is up to 3km deep. The New York Times’s mea culpa for its pre-war coverage of the Iraq crisis shows once again a particularly admirable side of the best of American journalism. The Times does, of course, take itself immensely seriously. There’s little of the inventiveness and fun that the better British newspapers display. But British papers are worryingly loath to admit to their own errors. An excellent piece by Toby Moore in the Financial Times Magazine (subscribers only) dissected the problem. It isn’t only The Mirror’s faked Iraq photos, according to Moore. He lists a number of incidents in The Daily Mail and The Daily Telegraph where fabrications were uncovered and then swept under the carpet. Honesty and openness is a far better policy if papers want to retain any of their readers’ trust. This entry was posted in Imported on May 26, 2004 by lance. Al-Qaeda has fully reconstituted and set its sights firmly on the US and its closest western allies in Europe. Al-Qaeda must be expected to keep trying to develop more promising plans for terrorist operations in North America and Europe, potentially involving weapons of mass destruction. There appears to be little chance in the immediate future that the security vacuum that has dominated Iraq since liberation can be filled. The war against terror and the Iraq conflict has led to diplomatic underinvestment in the Middle East peace process. And to think that I was puzzled today as to why I was feeling a bit gloomy. For the politically interested of a certain generation, reading Fanshen was one of the rites of passage. I haven’t a clue how William Hinton’s book would stand up to a rereading in light of what we all now know about the tyranny of the Mao years in China. But Hinton’s life story, as recounted in The Guardian’s obituary, certainly bears the telling. This entry was posted in Imported on May 25, 2004 by lance. There’s also some passably good news from Africa. The OECD reports that economic growth in Africa in 2003 was 3.6%, up from the 2.7% of 2002. This is still well below what Africa needs. Jim Moore has started an important campaign to raise awareness of the continuing genocide in southern Sudan, The Passion of the Present. Part of Jim’s campaign is to encourage weblogs — and other news sources — to write about the horror that is being perpetrated by the Sudanese government. Fortunately, the BBC has needed no persuading on this issue. Hilary Andersson produced a powerful report for tonight’s 10 O’Clock News, available here. Her key line: “A hidden catastrophe is unfolding.” This BBC page has links to a lot of information on Darfur. Tim Dunlop captures the kind of conversation I think we’ll hear a lot this year: “I’ve never been involved in fundraising before; I’ve never donated to a candidate before; we really have to do something to get rid of the incumbent; I don’t want my children growing up in George W. Bush’s sort of America or his sort of world”. Just in my own limited circle, I know several people who have never done anything more active than show up at the polling station who are actively involved in one way or another in getting rid of Bush. Straws in the wind. This entry was posted in Imported on May 24, 2004 by lance. Via Crooked Timber, I’ve found the UN’s 10 stories the world needs to know more about. A wonderful initiative. Now all they need to do is provide RSS feeds for each of the 10 stories and those of us who are interested can really keep up. This entry was posted in Imported on May 21, 2004 by lance. Having just read Paul Goldberger’s rave review of Rem Koolhaas’s Seattle Public Library, I was left with one unanswered question. Do they have the books that befit such an apparently grand building? My native city, Chicago, built a new public library a few years ago. The building is okay (although Goldberger plainly doesn’t like it at all), but there are no books. Okay, there are some books. But it is hardly a collection of the scale that Chicago deserves. (The name gives the game away to me: it’s not the Harold Washington Public Library, but the Harold Washington Library Center. I think they knew it wasn’t much of a library, so it’s a centre instead.) It sounds like Seattle’s librarian, Deborah Jacobs, is very switched on. I hope she has the books that the building merits. A case in point is my library of choice in London, The London Library. The building is plausibly close to falling apart. But its 1 million volumes are the right 1 million volumes. And they have a wonderfully responsive and active acquisitions policy. I may be late to the party on this, but University College London’s work on creating a three-dimensional, virtual London sounds wonderful. This entry was posted in Imported on May 20, 2004 by lance. The BBC is working on what sounds like a great project: One Day of War. The idea is for filmmakers to follow people in 16 different conflicts on the same day, 22 March this year. The result will be broadcast on 27 May, but some clips are already on the website. There’s also fascinating material about how they chose their subjects — the film is about individuals, rather than reports on conflicts — and how they tried to ensure the safety of their crews. It’s an ideal companion piece to the Nobel Foundation’s interactive conflict map, which I wrote about a short time ago. A reader, commenting on my Venice post, wondered whether I had noticed something fishy about the water bus service from the airport. I sure had. You have a simple choice to get to Venice from the airport. You can take the Alilaguna bus (which is, of course, a boat) for 10. Or you can take a taxi, for which the standard fare seems to be 40 a head. With that difference, last Thursday we decided to take the Alilaguna bus. Big mistake. As taxis (also boats, of course) zoomed past us, the Alilaguna went painfully slowly towards the islands of Venice. It takes over an hour to get to San Marco, which is visible from the airport. Was the problem technological? Did the boat need bigger engines? My conclusion, based on years of Italy watching and a painful year running a business in Italy, is no. I’m certain that the Alilaguna waterbus keeps to its painfully slow timetable because of some shady deal with the taxi company. If the bus went at normal speeds, it would take perhaps 30 minutes to get to San Marco. The taxis take 20 minutes. Most people would save the money for such a slight time difference. But when the time difference is three- or four-fold, if you can afford it, you take the taxi. On Saturday, we took the taxi. This entry was posted in Imported on May 19, 2004 by lance. Tonight’s evening news had a fascinating, lengthy report about the separatist insurgency in southern Thailand and what looks like its brutal suppression by Thai armed forces. A good example of the BBC’s depth and reach. What’s bizarre, however, is that the motivation for the story was not the questions it raised about the limits to the war on terrorism, or the potential damage to Thailand’s image as a friendly nation. No, the issue was that Thai prime minister Thaksin Shinawatra hopes to buy a chunk of Liverpool Football Club. You may have thought it unlikely to hear the phrase “human rights” and “Premiership club” in the same sentence, but apparently thousands of Liverpool fans are concerned about Thailand’s human rights record. I think that’s a good thing, but I also suspect that if Thaksin gets his stake and Liverpool at long last have a highly successful season next year, those concerns will vanish. I think it would be wonderful if, as now seems likely, Manmohan Singh becomes India’s prime minister. I ran a lot of articles about India’s economy in the ’90s, during Singh’s tenure. It’s a small point, but he was always gracious and helpful, and wore his intelligence lightly. There are a lot of very big egos in Indian politics, and Singh always seemed to stand aside from the fray. More qualified observers than I are also excited. It’s possible Singh will be able to walk the tricky path of placating the reactionaries in the Congress coalition while pushing ahead with the economic reform that has served India so well since he initiated the programme. Read the entire post to understand his explanation. This entry was posted in Imported on May 18, 2004 by lance. This entry was posted in Imported on May 17, 2004 by lance.